As oil continued to spread along the Gulf Coast this week, President Obama returned to the region for his first overnight trip. Upon his return to Washington, D.C. , he spoke to the nation from the White House, marking his first address from the Oval Office. No doubt, that location would have been preferred for BP CEO Tony Hayward, who was grilled on Capitol Hill by lawmakers over the company's handling of the oil spill. NOTE: DON'T FORGET TO TUNE IN TO OUR SPECIAL 2-HOUR LKL TELETHON, "DISASTER IN THE GULF-HOW YOU CAN HELP," ON MONDAY FROM 8-10pmEastern!! Editor's note: Ted Sorensen was special counsel and adviser to President John F. Kennedy. He will be on Larry King Live tonight, 9pm ET. Ted Sorensen says the Kennedys are not American royalty, but have dedicated themselves to service. NEW YORK (CNN) - With the death of John F. Kennedy's brother, Senator Edward M Kennedy, and their sister, Eunice Shriver, the founder of the Special Olympics for the developmentally challenged, there has been a wealth of news stories - obituaries and otherwise - about the recurring tragedies endured by what some call America's "royal family." All of these comments are well intended but off the mark. The Kennedys have been a remarkable family since its founding roughly a century ago by Joseph P. and Rose Fitzgerald Kennedy. But, its members have never asked for pity or privilege. Their history has emphasized more success than tragedy. Their love of family and country stood out during some of the most cynical and selfish periods in recent American history. Like any large family, particularly one which deservedly remained in the public eye for many decades, a large number of afflictions and setbacks, also in the public eye, was unavoidable. Nevertheless, the members of that family have never considered themselves "royal" or entitled to special privileges. We have no royalty in America, but ever since the Adams family sent several generations to public service in the earliest days of our nationhood, other families have demonstrated similar interests and commitments to public service. The Kennedys were taught as children and genuinely believed that American citizenship was a special privilege and honor, in return for which every citizen had an obligation to serve and help the country. Even the youngest generation of Kennedys today acts not out of a sense of entitlement but a sense of commitment. From the beginning, those members of the family who held or sought public office had the courage to take public positions on controversial issues, not always approved by the leaders of their party, church or respective constituencies. Nevertheless, they stood up and spoke out for what they believed was right, regardless of political and personal consequences. In short, they have had a proud tradition of becoming - not merely writing about - profiles in courage. 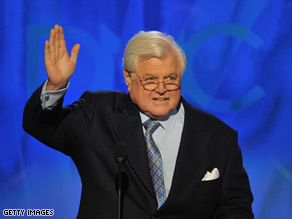 Ted Kennedy was treasured by liberals, loved by many of his conservative colleagues, revered by African Americans and Latinos, respected by hard-bitten political bosses, admired by students of the legislative process, and cherished by those who constituted the finest cadre of staff members ever assembled on Capitol Hill. The Kennedy paradox is that he managed to be esteemed by almost everyone without ever becoming all things to all people. He stood for large purposes, unequivocally and unapologetically, and took hard stands. Yet he made it his business to get work done with anyone who would toil along with him. He was a friend, colleague and human being before he was an ideologue or partisan, even though he was a joyful liberal and an implacable Democrat. He suffered profoundly, made large mistakes and was, to say the least, imperfect. But the suffering and the failures fed a humane humility that led him to reach out to others who fell, to empathize with those burdened by pain, to understand human folly and to appreciate the quest for redemption. Statements are already beginning to pour in regarding the death of Massachusetts Senator Ted Kennedy – we'll be paying tribute and want to hear your memories of the Senator. 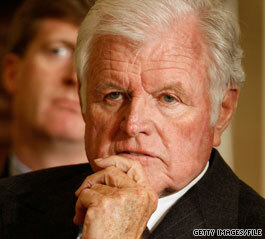 I was terribly saddened to hear of the death of Ted Kennedy tonight. Given our political differences, people are sometimes surprised by how close Ronnie and I have been to the Kennedy family. But Ronnie and Ted could always find common ground, and they had great respect for one another. In recent years, Ted and I found our common ground in stem cell research, and I considered him an ally and a dear friend. I will miss him. My heart goes out to Vicki and the entire Kennedy family. 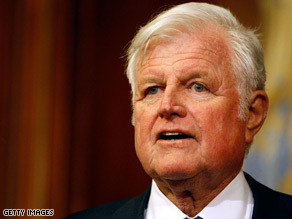 (CNN) - Massachusetts Sen. Edward Kennedy, the patriarch of the first family of Democratic politics, died Wednesday at his home in Hyannisport, Massachusetts, after a lengthy battle with brain cancer. He was 77. After the president of Harvard hailed him as a “national leader but a local servant,” after the pastor read the “Let us now praise famous men” passage from the Bible and after the cellist Yo-Yo Ma honored him by performing a Gershwin prelude, Senator Edward M. Kennedy lumbered across the antique stage. As the crowd rose, Mr. Kennedy waved buoyantly, as if trying to acknowledge everyone he saw: a special fist pump for his former staff member, Justice Stephen G. Breyer of the Supreme Court; a salute in the direction of Vice President-elect Joseph R. Biden Jr.; a thumbs-up for his niece Caroline Kennedy. Mr. Kennedy’s wife, Vicki, tried to lead him off, but he broke away, grinning. For a few extra moments, he kept the stage. Since the diagnosis of his brain cancer last May, Mr. Kennedy has been given all manner of tributes and testimonials, lifetime achievement awards, medals of honor and standing ovations. But even as those accolades have provided sweet solace — and even some dark humor — as he endures grueling treatments, Mr. Kennedy, who turns 77 on Sunday, has been intent on racing time rather than looking back on it.